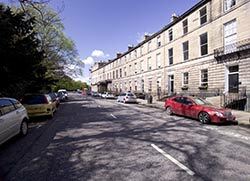 Abercromby Place (built 1807 - 1819) is one of the nicest in central Edinburgh: a 5 minutes' stroll from Princes Street, and fashionable George Street, relatively quiet, tree-lined on one side and with plenty of good places to eat around about. Free parking is available if reserved in advance. 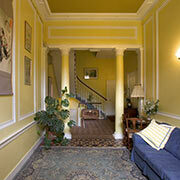 In the photograph of the entrance hall (left) you can see the door on the right which gives access to Veronique Johnston's large and spacious apartment which is available for self-catering rental on a weekly or daily basis (min 2-3 nights). The apartment can accommodate up to five: four people in two double bedrooms, with a further fold-out bed for another person. 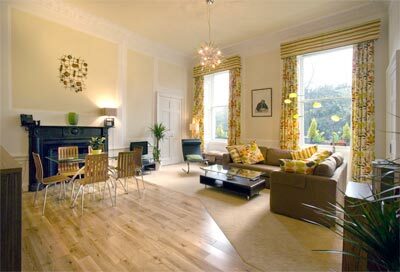 Large light living room with sunny south-facing windows, divided into Sitting, Dining and Kitchen areas. In front of the black marble fireplace you can see the dining table and chairs for 6. In the carpeted area between the table and the window is a television with cable tv and DVD player. The comfortable corner sofa has plenty of cushions. The original wooden window shutters are in working order, and the walls and cieling still have their original Georgian plaster decoration. Another view of the Sitting area, from the glass topped dining table. The apartment has broadband internet access for your laptop, and there is a CD Player. 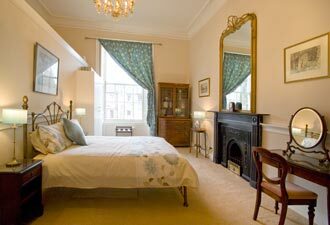 Double bedroom with Queen-size double bed. 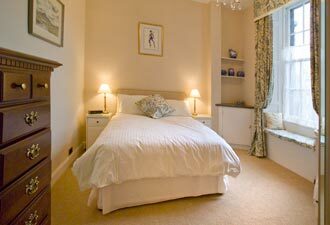 Double bedroom with standard double bed, with wash-basin and television. 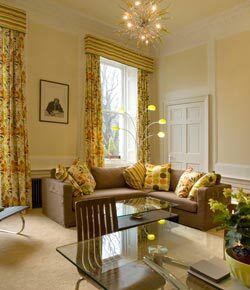 Abercromby Place is not a noisy street, and both bedrooms are even quieter being at the back of the house. Both have a hairdryer and radio clock. The shower-room. 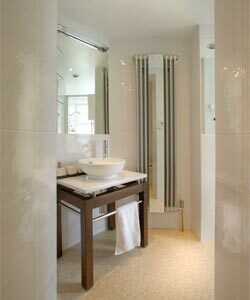 The shower itself is to the right - you can just see its reflection in the mirror above the basin. 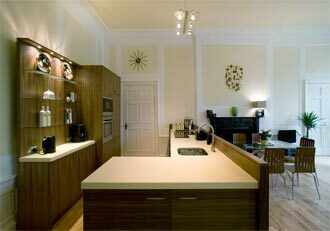 £80 to £120 per night, sleeping up to four. Free parking is available if reserved in advance. Prices include linen, towels, electricity, heating, etc. 2 to 3 nights minimum booking, depending on the time of year. 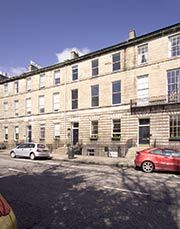 Abercromby Place faces Queen Street Gardens. Please tell Veronique you found her apartment through About Scotland!